Creations stories hold me captive. It’s a fascination that began when I first marveled at how the tellers of Genesis were somehow privy to certain basic aspects of the event we now call the Big Bang, as well as to the formation of the universe and the evolutionary history of life on Earth. I became even more interested when I gained an understanding of the correlation between the story of the Fall of Man and the complexification of consciousness that occurred as a result of the evolution of the human brain, an event that naturally caused the early human to be “expelled from a state of innocence” into one rife with self-consciousness and inner conflict. 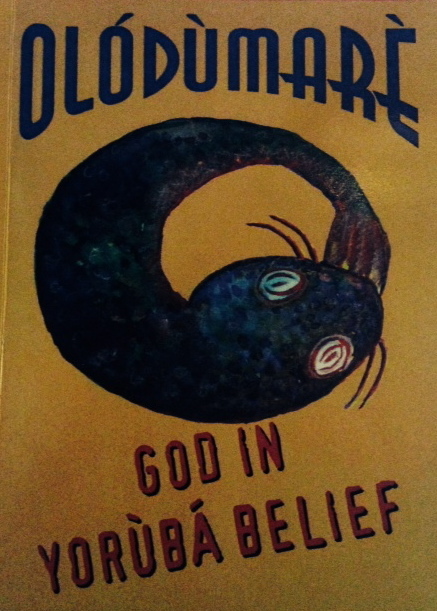 For me, the intuitive depth of creation stories inspire wonder, and so I found myself rapt as I was drawn into Olodumare: God in Yoruba Belief by E. Bolaji Idowu. Idowu, the First Patriarch of the Methodist Church of Nigeria from 1972 to 1984, published his first book, a theogony and cosmogony of the Yoruba religion of West Africa, in 1962. It was the result of his doctoral thesis, an heroic effort considering it was written during a violent anti-witchcraft craze led by both Christians and Muslims targeting Yoruba priests and priestesses. Idowu’s aim was to dispel the idea “circulated abroad and widely accepted… that the religion of West Africa is something without any real value – something in which barbaric crudeness is mercifully relieved by a touch of the ridiculous.” Clearly, however, the Yoruba religion was met with more than just condescension during Idowu’s time. For some it evoked a brutal fear, perhaps not just by perceived threats of differences, but also or perhaps even more so by similarities, for the Yoruba religion has many things in common with the Abrahamic religions, including but not limited to a Fall of Man and an underlying monotheistic concept of God. 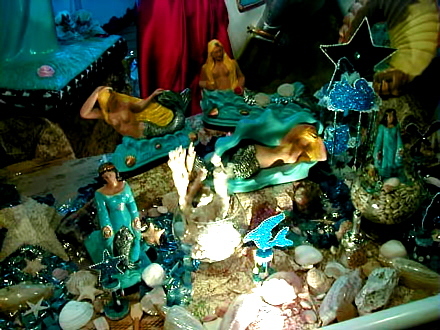 The Yoruba creation myth is told, Idowu explains, in a way that children can understand and goes as follows: Olodumare sent his arch-divinity, Orishnia, down to the watery earth to oversee its solidification and otherwise prepare it for humanity, a task he accomplished in four days with a packet of loose earth, a five-toed hen, and a pigeon. Though the fifth day was reserved for rest and worship, the project continued when Olodumare sent Orishnia down to the earth again, this time to plant four sacred trees to provide juices, oils and food. Meanwhile, the hen and pigeon had multiplied to provide other sources of nourishment, and when the planet was thus sufficiently prepared, Olodumare sent Oreluere, a pre-existent human being, to lead a group of his kind down to populate the earth. At this time, Orishnia was given the job of molding the human’s physical forms “from the dust of the earth,” but the ultimate responsibility of breathing life into the forms was reserved for Olodumare. The oral traditions explain that during this early stage of humanity, “heaven and earth were so close that travel between the two realms was possible and all beings could contact Olodumare directly as needed.“ Idowu describes it as “a kind of Golden Age,” but then an event occurred that caused a “frustrating, extensive space” or “barrier” to “cut (man) off from the unrestricted bliss of heaven.” The details concerning this event are varied, but all versions include a grievous sin such as the stealing of food from heaven or a defiling of it by the “dirty hand of a woman.” For me, these stories are all ways of describing the split in human consciousness that resulted from the evolution of the human brain, and it didn’t surprise me to note the cause of the great rift being attributed, in one version at least, to the mythologically notorious female, yet another similarity with the Abrahamic religions. Could this “frustrating, extensive space” be the highly-developed emotional brain, or limbic system, that literally separates the cerebral cortex from the brain stem? Or could it be the cerebral cortex itself? Or both?! Idowu doesn’t offer any interpretations, but he does tell us how the Yoruba Fall of Man played out in their beliefs and religious practices. “It considerably enhanced (the divinities) mediatory status,” he explains, and it is upon these divinities, or Orisha, and the culturally rich and spiritually demanding form of worship that they inspire that I wish to focus my wonder onto next. So, who are the Orishas? Idowu suggests diffused monotheism as a possible term for categorizing the Yoruga religion, then he tries to resolve the “subtle metaphysical question” as to whether the Orisas are the result of an “intellectual fragmentation” or are “indeed celestial overlords?” In the end, he explains that to the believer “…the divinities are as real as the ministering angels who all down the ages have been a constant source of spiritual comfort to those who believe in their existence.” They are, “in fact, so real to the worshipers that they have, for practical purposes, almost become ends in themselves, instead of a means to an end which, technically, they are according to Yoruba theology,” a point which brings me to the intensity of devotion that the Orishas inspire and require. Personal worship involves the creation and maintenance of highly symbolic altars which are attended through ceremonial cleansing, invocations, libations, offerings, communication by divination, and offerings. Offerings often include animal sacrifice, a controversial issue in the West no doubt, but on this point Idowa writes, “Sacrifice is of the essence of the religion of the Yoruba as it is of every religion the world has ever known. 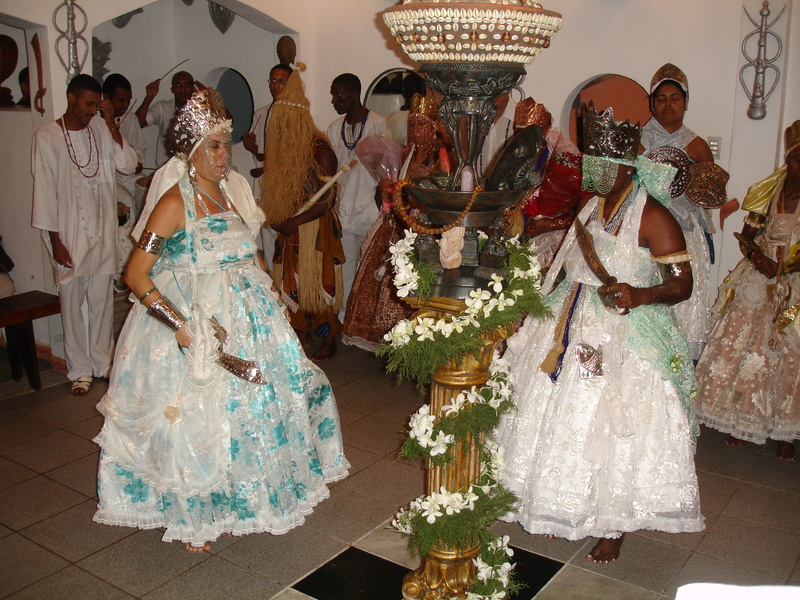 It is inconceivable to have a religion without some form of sacrifice, however modified or refined it may be.” Communal worship is more elaborate with the additions of very specifically arranged songs and complex music with dance accompaniment in ritual dress all enlivened with the intention of inviting possession. That special person, Felipe Garcia Villamil, holds among many honorable titles that of Santero or priest of Santeria. Santeria is the name given to “a religious practice based on the worship of Yoruba deities syncretized with Catholic saints….” Born in Matanzas, Cuba with both Yoruba and Congo lineages, Villamil is a “master Afro-Cuban drummer and craftsman” who considers his relationship to the sacred bata drums his destiny. 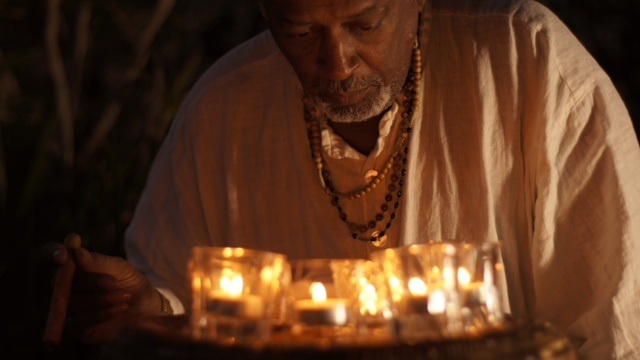 Drumming for the Gods tells the story of Santeria and its ritual music, a cultural practice of the African diaspora. It tells the story of how Villamil became a sacred bata drummer, or olubata, and managed to be true to his calling throughout the commodification of Afro-Cuban culture that was a part of the Cuban revolution. 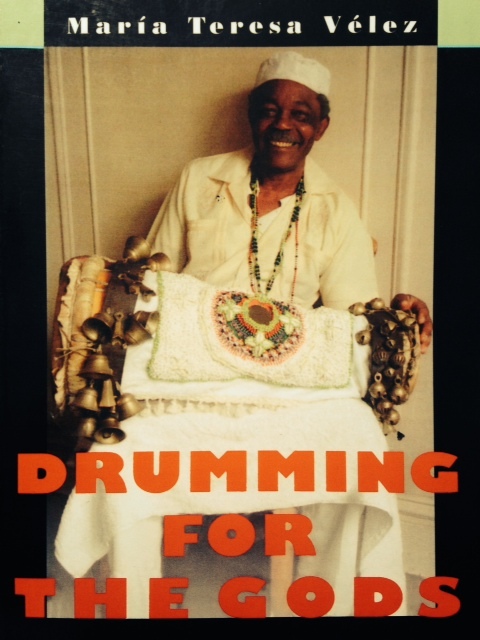 It chronicles his experience as an exiled Marielito who arrived in the United States in 1980 as part of the Muriel Harbor exodus, and tells of how the olubata of the Muriel exodus “reconstructed the tradition of ‘the transmission of the voice’ among sacred drums” in the Santeria community that had begun to develop in New York in the 1950s and 60s. “For Santeros, bata drums are not just musical instruments,” Velez explains, “they are a spiritual entity (Ana) in and of itself…. 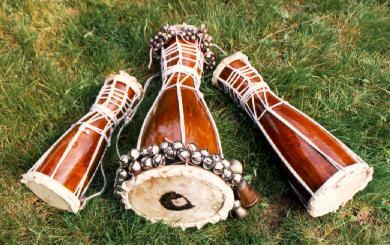 They have to be ‘born’ from a previously consecrated set of drums which transmits to them the ‘voice’ that is the power to talk to the orishas.” Through diverse playing techniques the drummers create a complex melodic effect or “conversation” that calls the Orichas to descend. “It is said,” Velez writes, “that the bata ‘speak tongue,’ meaning that they imitate the ritual language used to address the deities – Lacumi, a language that has origins in several Yoruba dialects. Yoruba is a tonal language,” she explains, “in which intonation has semantic value – intonation that can be imitated by the drums.” The drums are layered with chants that engage the Orishas as well, some which are intended to provoke the reluctant Orisha with jokes or double entendre. How intriguing! My Lutheran experience pales in comparison! And I am lucky to note this not just by reading a few books, but by my recent participation in an experiential class offered by Carolyn Brandy at The California Institute of Integral Studies. Though I only learned some basic rhythms and dance moves, non-ritually, I was brought to tears by just a glimpse into the cultural richness, communal spirit, deep roots, and spiritual reverence of this religious community. And those rhythms – they even have a hypnotic effect, (on me at least,) when played badly by beginners! I was also moved by a story that was told of one particular Orisha, Ochune. As I was pacing around my house trying to decide whether or not to end this paper with that story, I wandered into the living room to mull it over on the couch. Looking up at the mantle above my head, I saw a yellow candle that I hadn’t noticed before, (my housemate must have put it there,) and recognizing it as the type of candle sold in Santeria stores, I looked to see the image on the front and saw that it was a candle for Ochune. Clearly, my decision was made. A more detailed description of Ochune tells us that she “is the orisha of fresh water, of rivers and creeks. 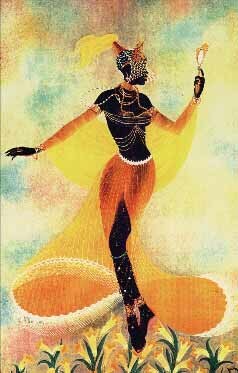 She is the deity of female sexuality, of love, eroticism, and sensuality, of gold and honey, beauty and vanity.” But she is also the Orisha who “saves the world,” and so has become, for some, a feminist icon. As the story goes, a crisis occurred a very long time ago, one that all the other principle divinities, (16 of the 17 are male by the way,) raced to solve while ignoring Oshune, (who was incredibly beautiful by the way,) and who was all the while saying, “I know what to do.” But it wasn’t until all their attempts had failed that the other divinities turned to Oshune to say something along the lines of, “Oh, well. Go ahead. Give it a try.” It was then that Oshune turned herself into a vulture and, in that form, was able to deliver a message to Olodumare that saved the world. To see dancers portraying Oshune in a folkloric performance, click the link below or copy & paste the following series of tags into your search box. Ajibade, George Olusola. “Negotiating Performance: Osun in the Verbal and Visual Metaphors,” Knights of Imhotep Library website. Altman, Thomas. (2000.) Cantos Lakumi: a los Orichas, Philadelphia: Temple University Press. Brandy, Carolyn. “Art as Sacred Practice,” course reader. Velez, Maria Teresa. (2000.) Drumming for the Gods: The Life and Times of Felipe Garcia Villamil. Philadelphia: Temple University Press. Idowu, E. Bolaji. (1994.) Olodumare: God in Yoruba Religion. African Tree Press. All images, with the exception of book covers, are courtesy of Wikimedia Commons. 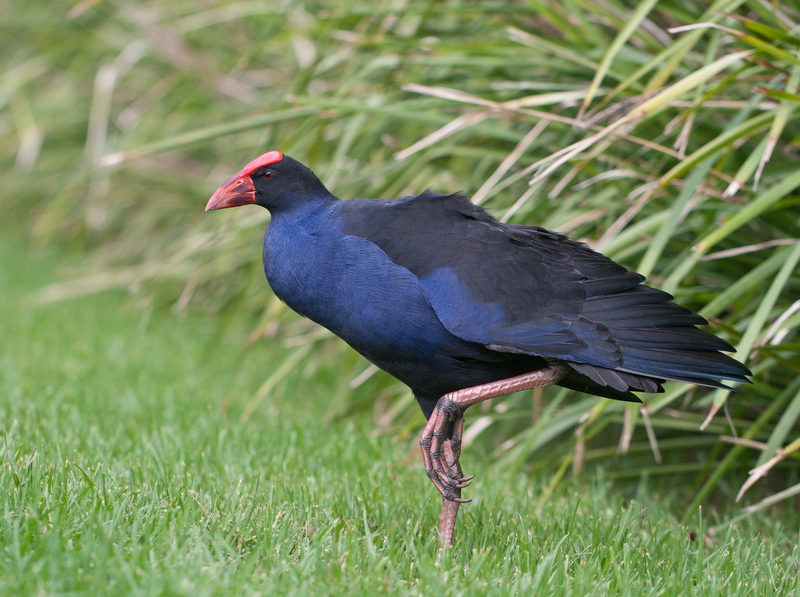 This article is published under the Creative Commons 4.0 License. This entry was posted in Uncategorized and tagged Bolaji Idowu, Drumming for the Gods, Felipe Garcia Villamil, Maria Teresa Velez, Ochune, Olodumare, Orisha, Orishas, Santeria, Yoruba religion. Bookmark the permalink.